This weekend was an occasion for double celebrations. First, was obviously the Mother’s day and second was for the nomination of Versatile Blogger award bestowed by Nancy of Feasting with Friends . No wonder I was super excited. I may sound childish but I love awards and I can’t thank Nancy enough for nominating me. The whole of this week, there were mother’s day reminders all over the place. Newspapers, whatsapp , Facebook and twitter were full of messages asking ‘What are you planning to do this Mother’s day‘, ‘How are you going to make this day special for your mom‘ and the like. I just was in a mood to tease my daughter who was sitting at home , enjoying her summer vacations. I asked her how she was planning to express her love for me on Mother’s day. She gave me a tight hug and told me, “Mom why does Mother’s day have to be once a year. I love you every single day”. Her answer set me thinking. I can understand birthdays, Uncles day, Aunt’s day, teachers day or for that matter even grand parents day coming once a year. But mothers are so wonderful that we need to make them feel special every single day of our lives. Beat butter and sugar till light and fluffy. Whisk the egg with the essence. 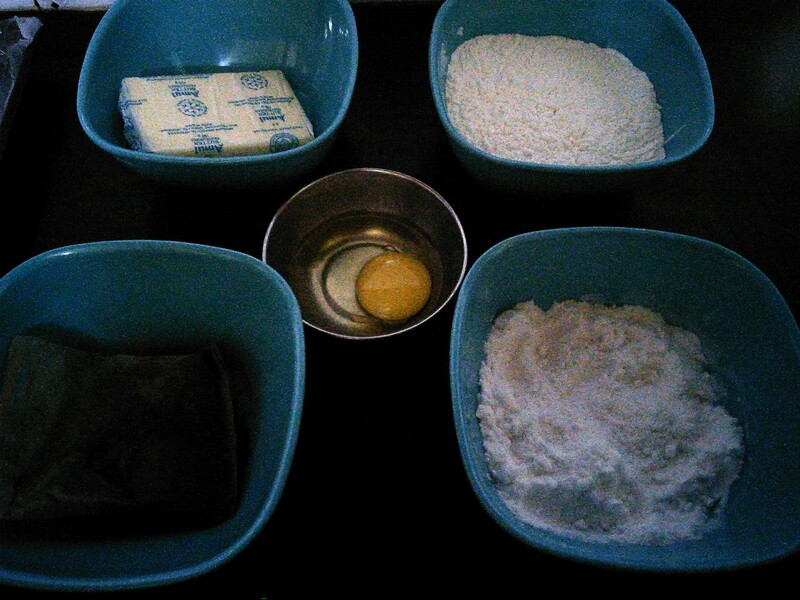 Sift together the flour, cocoa powder and baking powder. Mix all these and knead into a soft dough. Cover in cling wrap and keep in the fridge for an hour. Grease cup cake tins or tart molds. Roll out small portions of the dough and line the molds. Prick them all over and bake for 15 minutes at 175 º C .Let them rest for about ten minutes. Remove gently. I use silicone molds because they are easy to handle and the cookies come out without breaking. 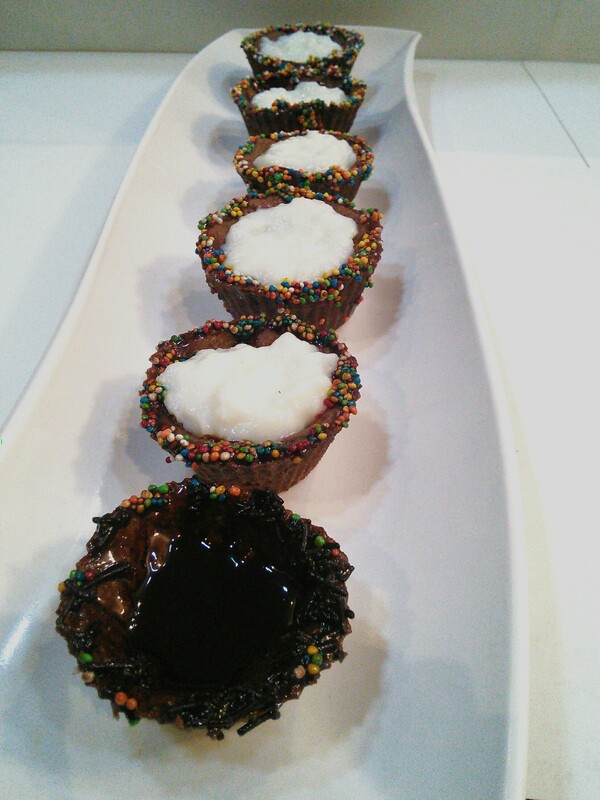 Dip the rim of cookie tarts in chocolate syrup and then into chocolate rice or sprinkles.Fill them up with sweet white custard. Chill and serve. This one Nancy is for you…. Nancy of Feasting with friends has been kind enough to present me first with the Liebster award and now with the Versatile blogger award. Awards are a humbling yet enriching experience. Who doesn’t like their work to be recognized. The rules of the award state that I have to thank and tag the person who nominated me , give 7 little known facts about me and on my part nominate 15 other deserving bloggers. Thank you so much Nancy for making blogging a beautiful journey for me. Feasting with friends is a super blog which whips up the most amazing sweets and savories. They are accompanied always with beautiful photos making them all the more appealing and filling you with an instant desire to try them out in your kitchen. I am very sensitive and emotional. I am health conscious but I love dripping cheese pizzas. I have done my Masters in English literature. I have to speak up when I see some thing wrong being done. I love books especially fiction. I love the smell of petrol(eeks I know it’s weird) and the smell of rain. Congratulations to all the nominees.All the best…. Yummy yummy. So are you Aiman…. 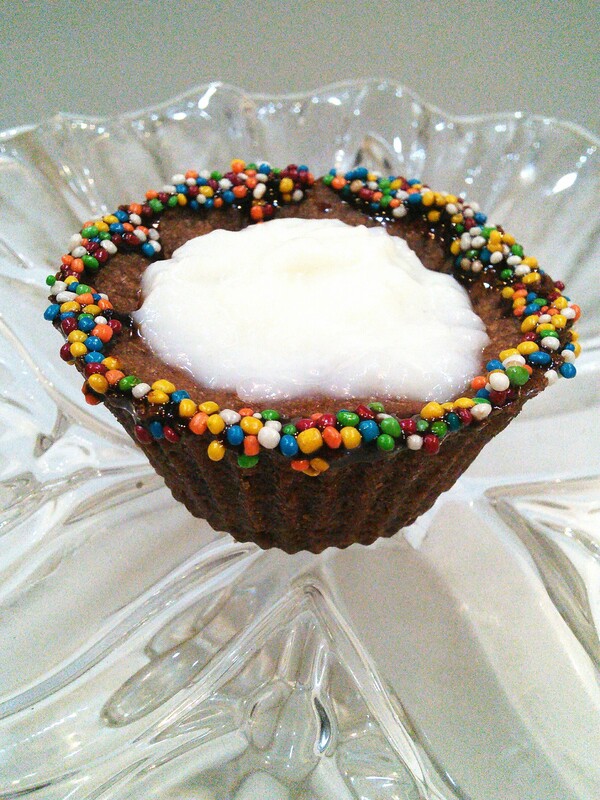 Lol 🙂 I meant you are awesome too …..
As for these little cookie tarts…they look delicious! I love the sprinkle edged one you presented to me, YUMMY! LOL! We all have our quirks. 🙂 On the other hand, I understanding the rain part! These look adorable, love the sprinkle borders! Thankyou so much. They tasted real good. What a great idea!! We will be preparing for a Tea in the upcoming weeks and I think this recipe could be adapted into something intriguing. Do try it. I am sure they will be a hit on your tea party. What’s more, you can make them in advance and they don’t turn soggy at all. The pleasure was mine. I like your blog. It is truly deserving of many awards, past and future. Thank you for the nice words Kruti. I like your blog too. It is truly deserving of many awards.Congrats again. Thanks for the nomination, I’m pleasantly surprised! This is really very nice of you, thank you very much! Your blog is not other than Uniquely Awesome!!! I was surprised when I saw that you nominated me. I am still young in this blogging system, so I was not really expecting anything, I just want to let the world what inspires me ( isn’t that what we all want!) The cupcakes look delicious….. yumyumyumyumyum. I wish I can literally eat those. 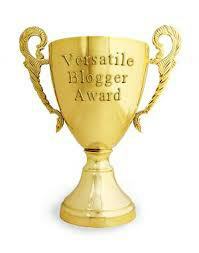 haha So to end this too much talk, I want to say that your blog deserve all rewards you got. Congratulations! My My.. my mouth is watery, and it ain’t stopping. I wish I could put them in my mouth.. Yummm. I can’t stop thanking you 😉 . Seriously I’m on cloud nine when i found myself among the nominees.. yay!!! too kind towards young blogger. ❤ ❤ ❤ . 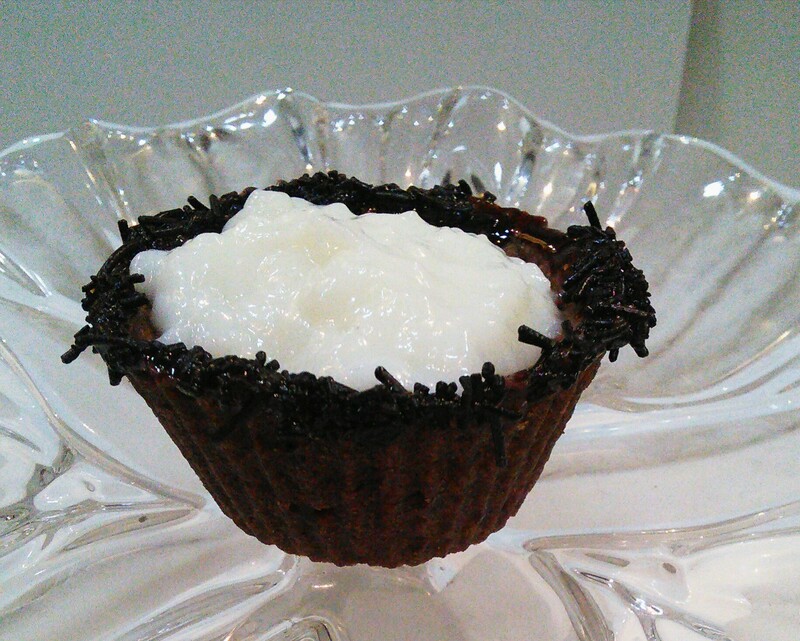 Yummy tarts, i love tarts… Congrats for your award!!! Enjoy!!! I know. i am one of the kind who loves awards and get very very happy on being nominated. It kind of gives a boost. Enjoy the feeling. you will have many more awards in store for you. Once again Thank u for the complements on Hyderabadi Shrimp Biryani😊.. Stay blessed..
Those look sooooo delicious! I’m virtually gobbling them up. 😉 And congratulations on your award! Chocolate never hurt anybody! I’m a chocolate fanatic. I love the shape of those. Tartas de galletas es un idea increíble. ¡Muchas gracias por las amables palabras!